Having a blog is one of my favorite side hustles! I love the freedom and control I have over it and I love being able to work from home. I also enjoy writing about topics I am passionate about. But I do want to get one thing out there and out in the open right up front: blogging is not “easy” and you will not make money overnight. Whenever you hear someone say that, don’t believe them. Blogging takes a lot of hard work and dedication – but that is what makes it so rewarding! 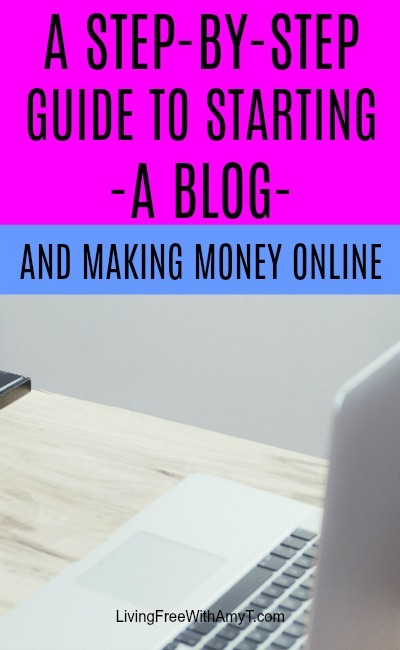 How can you make money through blogging? You earn a commission when someone makes a purchase through a link you placed on your website. You can add affiliate links right when you start blogging. Making Sense of Affiliate Marketing is the perfect course if you want to learn the ins and outs of affiliate marketing created by one of the most successful bloggers out there! You can read my review of it here: Why All Bloggers Should Take Making Sense of Affiliate Marketing. Companies sponsor you to write about their products. Don’t think you have to create your own product to earn an income blogging. Many bloggers make great income just from affiliate marketing alone. But there are many that do very well by creating and selling your own products. Does any of this sound like something you might be interested in? Then let’s get going on how to start a blog! Your niche is what you want to write about. Sometimes this is the hardest part. You may know that you want to start a blog, but you have no idea what you actually want to say through your blog. Some bloggers start writing about many different topics until they figure out what they enjoy writing about most. Others, like me, knew exactly what they wanted to write about before they ever started. It was easy for me because I knew what I was already passionate about: financial freedom and productivity. I knew that I wanted to help people simplify their lives, lessen the overwhelm, and actually free up more of their time by getting their finances under control and learning how to be more productive. I even asked my husband what it is I talk most about and he said exactly those same topics. So I knew I was on the right track! If you are unsure of what to write about, start with jotting down different topics you are passionate about. Do you have any hobbies? Particular books you like to read? Places you like to go? Do people often come to you and ask you for advice about specific topics? Is there anything you love to teach people? Ask those closest people to you what they think you are most passionate about. What do they hear you talk about often? Write all of this down and cross off anything you know of right away that does not interest you to write about. Then once you have your list narrowed down, see if you can connect the remaining topics in someway. For example, if you did not cross off cooking and being a mom from your list, you can easily start a mom blog that incorporates both topics. If you are still unsure, then just start writing and see what flows from you! There are many bloggers who change their niche or make it a little bit more specific once they start writing and can determine what their audience is looking for. Your domain is your www.yourblogname.com. This can also be a difficult part of the process. Although it is fun to come up with different names, it can be hard to narrow it down to one! You will hear over and over that the name of your website isn’t as important as the quality of your posts. If you write great content, people will find your website regardless of the name. That isn’t to say that the name isn’t important at all, but don’t make it the most important. The most popular place to search for and purchase a domain name is GoDaddy.com. At GoDaddy you can find out if a name you like is available and how much it is to purchase. To understand what the host of your website is, think of it like the hard drive of your computer, only for your website. Although you can choose GoDaddy to host your website, most bloggers do not. There are other hosting platforms that are more suitable for bloggers. I recently switched from a previous host to SiteGround and I couldn’t be happier! The switch was very quick and easy and SiteGround’s customer service is excellent. They got back to me right away when I needed something and so far switching was one of the best moves I have made this year. SiteGround has very affordable plans starting out as low as $3.95 per month, so it is definitely an option for beginner bloggers as well as experienced bloggers with larger websites. I chose the GrowBig Plan for $5.95 a month. Still very affordable! With whatever hosting company you choose to go with, just make sure you choose one that you pay for. The free ones limit your freedom and it is nearly impossible to earn and income from them. To understand what the blogging platform is, think of it like the operating system of your computer, only for your website. WordPress is by far the most popular blogging platform. It is easy to use, especially for anyone that does not know a thing about coding a website. It takes a little bit of getting used to, but it can be really fun! You definitely want to choose WordPress.org and not WordPress.com. With WordPress.org, you self host your own website, which means you have a lot more control and can earn a higher income. If you choose to go with SiteGround as your host, they already have plans customized for WordPress websites. Unless you’re tech savvy, I would suggest contacting someone at your new hosting company and have them walk you through how to install WordPress on your new domain. For my website, I chose a theme through StudioPress using the Genesis Framework. The Genesis Framework is very popular among bloggers. It is great for Search Engine Optimization and has beautiful, affordable themes. Writing doesn’t have to be your last step. You can start writing before you have your website set up. In fact, I think it’s a great idea to have a few posts already written before you even launch. That way your readers have more than one post to read at a time and have a reason to navigate your website. Whenever you have spare time, just write. Get as many posts done as you can right up front so you have a head start. Anytime you have an idea for a topic to write about, make sure to jot it down so you don’t forget. I hope you enjoy setting up your blog! Blocabulary Plus is a very detailed ebook that clearly defines different blogging terms. There is a great section all about WordPress as well, which could be very helpful in learning how to navigate it. And it’s only $39! Making Sense of Affiliate Marketing is the must have course for anyone that wants to learn the ins and outs of how to earn an income through affiliate marketing. The creator of the course is one of the most successful bloggers out there so she knows what she’s doing! You can read my review of the course here: Why All Bloggers Should Take Making Sense of Affiliate Marketing or go straight to the course with my affiliate link Making Sense of Affiliate Marketing. Billionaire Blog Club in my opinion is THE course for all new bloggers. It has everything you need to learn all about blogging. The creator has 11 very successful blogs and teaches you step-by-step how to grow your blog, promote it, and more. If you can afford a course that teaches all about blogging, this is the one I highly recommend. It has helped me out so much! Is there anything you would like to add to starting a blog that you think would be helpful? Please share in the comments below!